£2590 worth of prizes to be won! 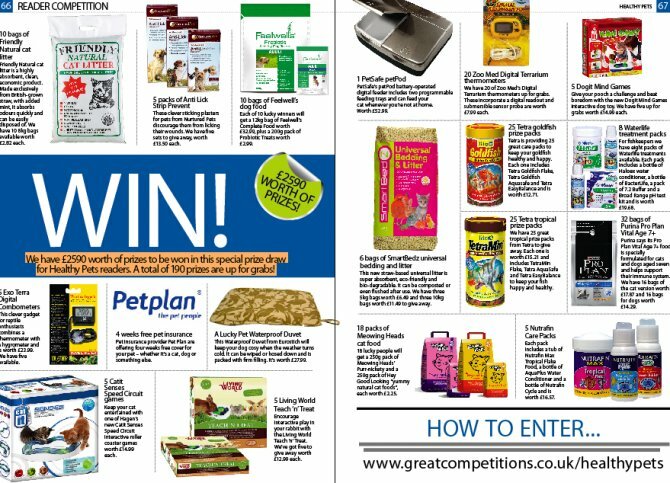 We have £2590 worth of fishkeeping and other pet-related prizes to be won in this special prize draw, in association with our sister magazine Healthy Pets. A total of 190 prizes are up for grabs! Included in the prizes up for grabs are Waterlife Treatment Packs worth £19.68 each, Nutrafin Care packs with a value of £16.57 each and 25 Tetra Goldfish and Tropical prize packs, worth £12.71 and £15.21 each respectively. But chances are, you probably have other pets in your household and this great competition also includes prizes for your cat, dog, small animal and reptile. You'll find full details of all the prizes on the competition website. All you need to do to enter is visit the competition website and tell us which pets you own. Then we'll enter you into the appropriate competitions. If your entry is randomly selected when the 190 prizes are drawn, we'll send you one of the prizes! But hurry – the competition closes on November 29, 2010. You'll find the full terms and conditions on the competition website.